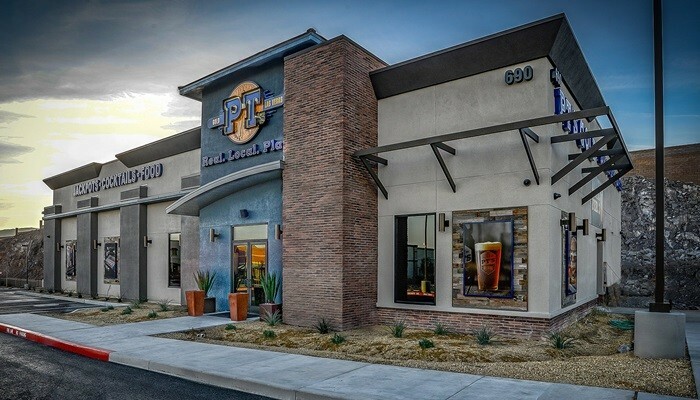 Located just one mile south of the Henderson Pavilion events center, the first of the two new facilities to open was PT’s Gold (pictured) at 690 South Green Valley Ranch Parkway, which began welcoming patrons on Feb. 3. The other new PT’s Gold opened for business on Feb. 10 at 9732 West Maule Avenue in southwestern Las Vegas, according to the company’s press release. Both of the traditional neighborhood taverns are operated by PT’s Entertainment Group and feature a wide variety of award-winning food and beverage choices. Along with comfortable seating, craft beer from PT’s Brewing Company and HD 4K TVs, both PT’s have 15 bar-top slot and video poker machines. The PT’s in Henderson will have an additional amenity in the spring when its outdoor patio opens. Guests can also count on both PT’s featuring the brand’s award-winning happy hour, where from 5pm to 7pm and from midnight to 2am the taverns offer half-off drinks and select appetizers and pizzas for $5. All 59 PT’s taverns in Nevada are part of the Beer & Bites dining loyalty program and the Golden Rewards player loyalty program. According to the company’s press release, together, the two new taverns will employ nearly 50 team members. Included in the company’s tavern brands are: PT’s Pub, PT’s Gold, PT’s Ranch, PT’s Brewing Co., Sean Patrick’s, Sierra Gold and SG Bar. Formed by the merger of Blake Sartini’s Golden Gaming and Lakes Entertainment in January 2015, Golden Entertainment, Inc. owns and operates gaming properties across two divisions –distributed gaming and resort and casino operations. The Company operates some 16,000 gaming devices, 114 table games, 5,162 hotel rooms, and employs more than 7,200 team members. The company owns eight casino resorts; seven in Southern Nevada and one in Maryland and via its distributed gaming business in Montana and Nevada owns nearly 60 traditional taverns in Nevada and operates video gaming devices at approximately 1,000 locations.